Dr. MacDonald graduated in 2001 from Atlantic Veterinary College in Prince Edward Island. Prior to this, she earned her bachelor’s degree in Biology from St. F. X. University in her hometown of Antigonish, Nova Scotia. 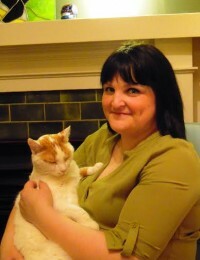 After graduation, she worked in both large and small animal practice in Nova Scotia before relocating to Ottawa, Ontario to work at Bytown Cat Hospital, where she spent 10 years. In 2014, she made the move to Hamilton, where she has family living, and to Beattie Pet Hospital in Ancaster. She lives with her partner Dave and four cats (Cookie Dough, Casey, Poppy and Cider) and finds happiness in her patients, her family, music, reading, old movies, cooking and baking. She has special interests in feline medicine, gastroenterology and pain management. She is proud to be a part of the Ancaster Beattie team.